Zurich, Switzerland, July 26, 2016 - Solar Impulse has made history by completing the first ever round-the-world flight powered only by energy from the sun. The plane landed at its starting point in Abu Dhabi at 04:05 am local time, after a final leg of 48 hours and 37 minutes from Cairo. "This is a truly historic achievement, with tremendous symbolic significance," said ABB CEO, Ulrich Spiesshofer. "It demonstrates clearly that with pioneering spirit and clean technologies, we can run the world without consuming the earth. On behalf of everyone at ABB, congratulations to Bertrand Piccard, André Borschberg, and the rest of the Solar Impulse team. We are extremely proud to have been able to contribute to this remarkable project." ABB forged the innovation and technology alliance with Solar Impulse because what the project has achieved in the air, ABB is doing on the ground, as a pioneer of power and automation technologies for 125 years in Switzerland. "It's a historic first for renewable energy and clean technologies, not only for aviation", said Solar Impulse pilot, initiator and chairman Bertrand Piccard, on arrival." By combining their respective strengths, Solar Impulse and ABB were able to show how breakthrough innovation can be transformed into credible solutions, and how energy can be more efficiently produced, stored and used to create a cleaner world." Solar Impulse co-founder, CEO and pilot André Borschberg confirmed the value of this partnership: "The mission would not have been possible without the expertise and support of ABB and other organizations that contributed to the project. As part of its innovation and technology alliance with Solar Impulse, ABB provided experts to support the mission, including engineers who served as embedded members of the ground crew throughout the round-the-world flight." To attempt the round-the-world flight, Solar Impulse had to confront many of the challenges that ABB is solving on the ground for its customers, such as maximizing the power yield from solar cells, integrating renewable energy into the electricity distribution systems, and improving energy efficiency. During its flight around the world, Solar Impulse made stopovers on four continents (Asia, North America, Europe and Africa), and flew across two oceans (the Pacific and the Atlantic), as well as the Mediterranean Sea and the Arabian Peninsula. 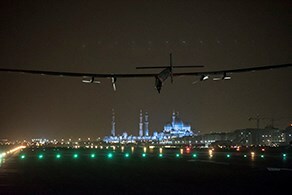 On the way, it set several new aviation records, including that of the longest solo duration for an airplane (117 hours, 52 minutes) achieved by André Borschberg on the leg from Japan to Hawaii, and the first crossing of the Atlantic Ocean in a solar airplane achieved by Bertrand Piccard.